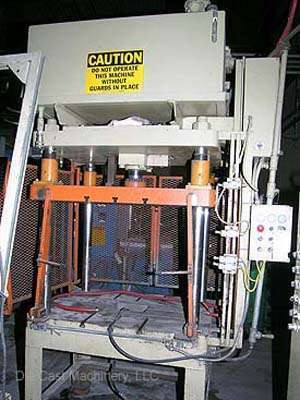 For Sale: One - Used - Metal Mechanics 35 ton hydraulic trim press for sale DCM 1603. Inventory item: DCM-1603. One used (second hand) Metal Mechanics, Model: 35, 35 Ton 4 Post Hydraulic Trimming Press, Serial Number: 2167, New in: 1998, Equiped with Allen Bradley SLC 500 controls, three (3) core circuits, Air Safety Ratchet, Dual Operator pull-out bars, 37-1/4" left to right, by 27-1/4" front to back clearance between tie bars, 32" daylight, 23" stroke, 9" shut height. Cell Number: 8, DCM Inventory Number: 1603 This item is part of the â€œLunt Manufacturing Companyâ€ liquidation. It may be viewed at the Lunt, Hampshire facility located at 200 Brandt Drive, Hampshire, IL 60140. To view all of the available items at Lunt Manufacturing, please click on â€œView Machineryâ€ and then click on â€œLunt Manufacturingâ€. To schedule an appointment to inspect this machine or other items at Lunt, please call our office at 847- 360-9170.